A team of archaeologists has uncovered the tomb of the brother of Sarenput II, one of the most important Egyptian noblemen from the 12th Dynasty. The discovery reveals new details about those who lived within the corridors of power during the period. The team from the University of Jaén in Andalucia made the discovery in Aswan, Egypt where they have been working since 2008. 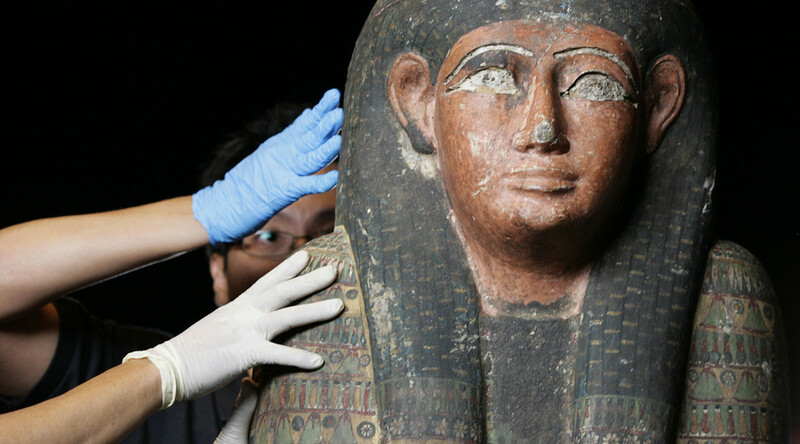 A mummy was found inside the tomb along with pottery, two cedar coffins and two wooden models representing funerary boats and scenes of everyday life at the time, according to a statement from the university. Alejandro Jimenez-Serrano, one of the archaeologists involved in the dig, said the discovery was unique as it’s the first time offerings have been found in the corridor leading to the burial chamber. The discovery was made on March 6 but details were only revealed on Wednesday after it had been thoroughly documented. Un estudio paleontológico de la #UJA revela que las huellas de saurio de Santisteban del Puerto corresponden a un reptil bípedo de hace 230 millones de años. The mummy was discovered along with a coffin inscribed with his name ‘Shemai,’ believed to belong to the brother of Sarenput II, a nomarch who served during the reign of pharaohs Senusret II and Senusret III, more than 3,800 years ago. His body was covered in a polychrome cartonnage with a mask and collar, and is said to be well preserved. El equipo que dirige la #UJA en la necrópolis de Qubbet el-Hawa en Asuán descubre la cámara intacta del hermano de un importante gobernador egipcio. Other inscriptions on the coffins bear the names of his mother and father, Satethotep and Khema respectively. No other mummies were found in the tomb. The head of the Ancient Egyptian Antiquities department at the university, Dr Mahmoud Afifi, said the discovery sheds light on the lives of high-born individuals of which previously little was known. “In fact, there is not much information about them,” Afifi told Egyptian Streets.